14ymedio, Generation Y, Yoani Sanchez, Havana, 22 March 2017 — A year ago Cuba had a once in a lifetime opportunity. US President Barack Obama came to the island willing to turn the page on political confrontation. 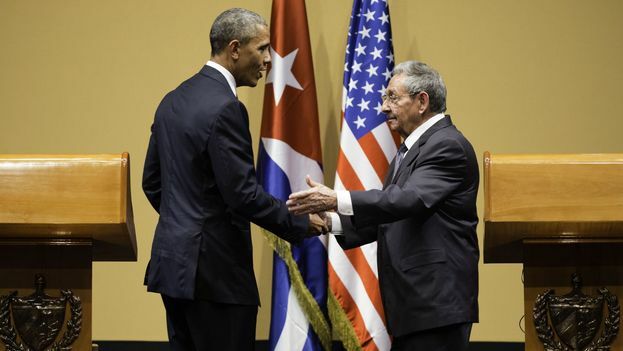 The gesture transcended the diplomatic situation, but Raul Castro – fearful of losing control – responded by putting the brakes on economic reforms and raising the levels of ideological discourse and repression. Nations are not presented with opportunities every year, nor even every century. The decision to entrench itself and not to undertake political flexibilizations has been the Plaza of the Revolution’s most egotistical measure of recent times. Failure to know how to take advantage of the end of public belligerence with our neighbor to the north will bring this country lasting and unpredictable consequences. These effects will not be suffered by the so-called “historic generation” – those at the forefront of the 1950s Revolution – now diminished by the rigors of biology and desertions. Rather than the generals in olive-green, the ones who will pay the price will be those who are still sleeping in their cradles or spinning their tops in the streets of the island. They don’t know it, but in the last twelve months a short-sighted octogenarian tricked them out of a share of their future. The greatest waste has been not exploiting the international moment, the excitement about foreign investments, and the expectations everywhere in Cuba of taking the first steps towards democratic change without violence or chaos. It was not the job of the White House to encourage or provoke such transformations, but its good mood was a propitious setting for them to be less traumatic. Instead, the white rose Obama extended to Castro in his historic speech in Havana’s Gran Teatro has faded, beset by hesitations and fears. Now, it is our job to explain to these Cubans of tomorrow why we were at a turning point in our history and we threw it away. Drama for the nth time in Vzla. Latin America has stated to notice. The trick is to make the Chavista criminal outfit unable to pay the military. Most of the comments here have railed against the lack of human rights, justice and just about everything else.The causes however, are historical, geopolitical, socioeconomic, etc etc etc. For US Prez BHO what he did was a symbolic prestige project. Could he have initiated more economic change that would have undermined Castrismo and truly lifted the Cuban people? The US has its own challenges and isn’t in the mood for long term projects anywhere abroad that isn’t military presence. The OAU is completely pathetic and unwilling to do anything about Venezuela. History takes its course, and CubaZuela will shine eventually. Then at least, when change hasn’t been imposed from outside, will lessons be learned well. There is no reason for a revolutionary retreat and comprise of principals like that suggested by Ms. Sanchez. A return to capitalism regulated by a new or old ‘democratic’ ruling class would bring only poverty and devastation upon the revolutions children which is the path that Ms.Sanchez sanctimoniously proposes as away to protect the revolutions children. Ms. Sanchez no doubt has been missing the debate in the US Congress on how to provide health care for all without turning the great majority of the population into paupers like those currently pushed into bankruptcy by healthcare costs. She either has never seen or ignores the prisoners who face a two meal starvation diet and the families living in automobiles in the great protector of democracy to the North of Cuba. A democracy where the newly elected President has a 37% approval rating after being elected by 30% of the population. Unlike the Soviet Union, where the massive theft of natural resources allowed the red aristocracy to become multi-billionaires, there is no incentive whatsoever for the Cuban bosses to give up their power, however pathetic their fiefdom.